MANILA -- Speaker Gloria Macapagal-Arroyo on Thursday expressed support to the possible extension of martial law in Mindanao. Arroyo made the statement in response to the idea floated by Executive Secretary Salvador Medialdea, following the recent bombing that killed three people and wounded several others in Isulan, Sultan Kudarat. "I support martial law in Mindanao," Arroyo said in an ambush interview in Floridablanca, Pampanga. 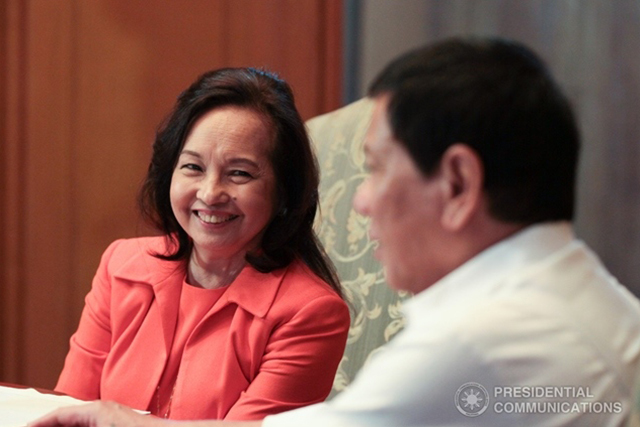 "I support what the President does because I've been president and I believe that he does not need a peanut gallery to tell him what to do," Arroyo added. Meanwhile, Majority Leader Rolando Andaya Jr. said while the declaration or extension of martial law is the call of the executive branch, Congress would give its concurrence. "The President declares or extends, Congress concurs. If the President will ask for it, then it shall be given," Andaya said in a text message. Andaya suggested that Malacañang calls for a meeting with the National Security Council or the Legislative-Executive Development Advisory Council to discuss the progress of the Marawi rehabilitation and the implementation of the Bangsamoro Organic Law. "What are the financing bottlenecks for example? Bottomline, the people of Mindanao should be consulted. Sa House, mahalaga ang inputs and views ng Mindanao bloc (At the House, the inputs and views of the Mindanao bloc are crucial)," Andaya said. "Those in or around ground zero should be consulted. Civilian views should be part of the discussion," he added. Reports showed that the blast happened around 8:34 p.m. Tuesday, when an improvised explosive device went off in front of J and H Marketing along the national highway in Barangay Kalawag 3, Isulan, Sultan Kudarat.